I am in the process of updating my boys’ bedroom. Well actually, right now I’m visiting family far, far away from my boys’ bedroom…but that need not stop a girl from decorating! I needed a lamp for my kiddos’ nightstand and found this guy lurking in my parents’ attic. The drum shade was a $2 thrift store find and the lamp used to be mine as a child. And by the way, yes, you are looking at my handiwork here. That little Cinnamon Toast Crunch sticker was my idea of decorating in 1984! Thank goodness my taste has matured some. Well, at least my taste in decorating. I’m afraid I can still put away a bowl of Cinnamon Toast Crunch like nobody’s business. In order to update the look of the lamp, I painted it white and while the paint was still wet I distressed it with my fingernail. Then, I bought a Perry Ellis men’s shirt at a thrift store for $1 and wrapped it around the shade. I tried to be good and do this the right way. I even watched a little cover-a-lampshade-youtube-tutorial that told me to make a pattern for the shade out of newspaper. That’s about the time I discovered that I’m completely pattern-retarded, and let’s just say it was just not working. My newspaper didn’t even fit around the lamp. So, I stuck to my wrap and cut plan and felt much less incompetent. I used spray adhesive (for the first time I might add) to adhere the shirt to the shade. I just sort of smoothed and pulled and tucked and glued my fingers to the lamp. Seriously. I was glued. to. the. lamp! I felt like I was in an I Love Lucy episode trying to shake the shade off my hand only to get it stuck to my scissors, only to then get stuck to my other hand. How in the world do you girls use this stuff without getting stuck to everything? Needless to say, it was embarrassing and comical. And yet so worth it! Here he is all manly-manned out and ready for my boys’ room! Really cute. I would have never thought to leave the buttons and pocket on. lol! You had me laughing all the way through this, Beth! You sound so much like me when trying a project out for the first time. I think, “Good gravy! WHat in the world is wrong with me….?? ?” But then you just kinda work it out on your own and do it your own way — and it’s all good! 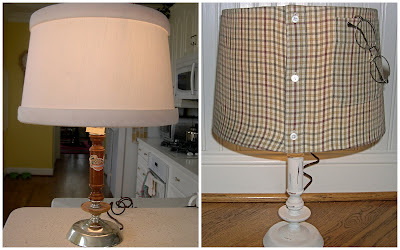 Love the whole idea of using a shirt for a lampshade! I’m sticking this one in my pocket for future use! Merry Christmas to you! I so love your gluing technique as well as your pattern retardedness. We are truly kindred spririts.. This is TOO cute!! What a fabulous idea!!! I love the pocket—that's so great for the kids to stick things in! The lamp looks great, whatever method you used, it works! I love this one! It almost made me tear up because I thought it was a shirt of dad's, especially with the glasses added! Brilliant! Turned out so cute! The sticker cracks me up! Really cute idea! 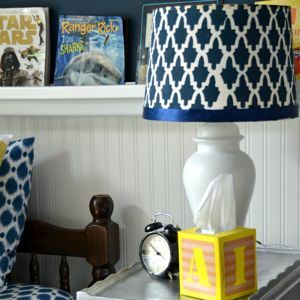 You could put a little ribbon around the top to hide where you glued when the lamp is on–just a thought. How clever! I used a skirt to hide the shade in my dining room, never thought to use a shirt. Great thinking! Thanks for joining me today and make sure you entered the giveaway for the Purdy paintbrush! Are you creative or what, girl?! Wow, great transformation! Beth, this is great! It looks very stylish!! First of all you scored on the shade…only $2.00?? Good job! but then you made it so much more interesting!! We absolutely love your project!!! What a great and unique idea! I love the way it turned out, perfect for your son's room! Cute idea and your narration is hilarious! So cute and easy to match to room decor. You can even leave your ds some notes in the pocket. That is just too cute! I love how you kept the buttons and pocket showing. And I know what you mean about the spray adhesive!! wow this is great, you never know what you can do with an old mens shirt lol!